For a child to develop healthy eating habits, there must be substantial involvement and effort from the parents. They must take charge of their child’s eating behaviors if they want to avoid future problems, like overeating or extreme pickiness at mealtime. Habit…that’s the key! Children are creatures of habit, as are most adults, really. In fact, we call feeding “eating habits”. So let’s explore how these habits develop, and how parents drive that development. Children learn much of their behaviors by imitating their parents. When a child sees their parent snacking in between meals, they’re more likely to want to do the same. As a result, grazing parents may have grazing children. And today’s busy parent may have difficulty monitoring the amount and quality of a grazing child’s food consumption. As parents, we want our little ones to have enough to eat, so they’ll grow and develop, and have energy for all the fun they need to have during waking hours. 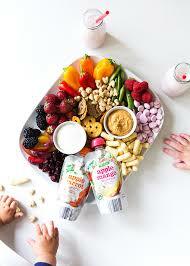 Parents may offer nibbles throughout the day, thinking their children are hungry and not getting enough to eat. Snacks generally appeal to children more than meals, and the in-between mealtime eating, or grazing, evolves into a habit that complicates healthy eating habits. If you already have a grazer in your care, you can change that habit with patience and persistence. It’s nearly impossible to change habits abruptly, so make a commitment to gradual change by implementing small steps. Begin by limiting accessibility to “grab and go” foods. And then start limiting eating “on the run”, by having meals at the table…either at home or at restaurants. Make mealtimes social occasions, and talk with your little ones while they enjoy their breakfast, lunch, or dinner. If your child doesn’t seem interested, let them help you find ways to make meals more interesting…. But within limits. Your little ones may want to experiment with food combinations, so let them, but you may want to hide the chocolate syrup! While you’re making the transition away from grazing, remember that it must be gradual, and be sure to have healthier options available. A simple switch from cookies to fruits and chips to nuts will help. Don’t hesitate to add some veggies and dip. Just don’t keep them constantly in sight, since having food readily available and visible encourages grazing. Be sure to put food away, so getting to it requires thought and action, which makes eating a conscious, deliberate action, and not a blind habit. Children will feel hungry and begin to understand the best way for them to satisfy that gnawing feeling in their tummies is to eat. They’ll sit at the table and focus on the food and how it makes them feel, instead of blindly stuffing whatever they can grab into their mouths. As an added bonus, hungry children will be more interested in what they have on their plates, and more likely to eat it, and try new foods too. By both parent and child making the transition from grazing to meals with occasional snacks, families can look forward to smooth mealtimes… or “bites without fights”.